Can Carrots Change the Color of Your Urine? In certain instances, what you eat and drink can change the color of your urine. Certain foods, such as carrots, rhubarb and juices can influence the color of your urine. Urine normally has a yellow hue but some foods, and even vitamins, can cause your urine to turn yellow, dark brown or fluorescent green. Your urine also can change colors for other reasons, such as illness and due to certain medications. When you eat carrots or drink carrot juice, your urine can turn orange in color, according to the Harvard Women's Health Watch. The color change of urine from carrots is harmless and temporary, but it can still be alarming. 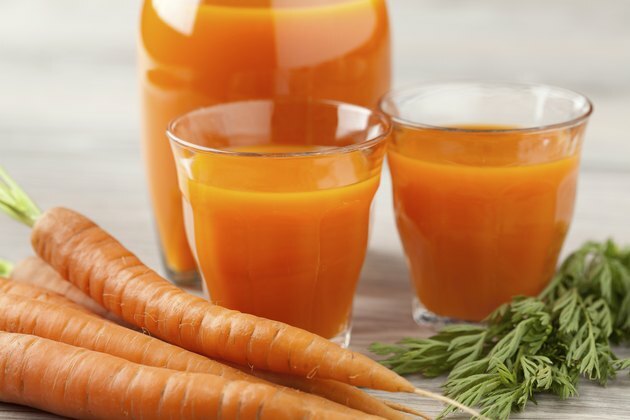 Mayo Clinic pegs the pigmentation of carrots and carrot juice as one of the top contributors to orange urine, in addition to vitamin C. Carotene, the orange pigment found in carrots, also can discolor your fingertips, palms of your hands and the soles of your feet. Other foods with a similar pigment can have the same affect on your urine such as winter squash and other vegetables. Other causes of orange urine can result from taking certain medications, such as antibiotics, blood thinners and other medications used to treat urinary tract infections. Certain chemotherapy drugs and some laxatives also can cause your urine to turn orange and have a similar appearance as if you ate carrots. Dehydration also can cause your urine to appear a deeper than normal color. The hue of your urine may appear so much darker in color that it almost looks orange instead of yellow. This is due to the concentration of your urine. When you are hydrated and your body has plenty of fluids, you tend to urinate at regular intervals throughout the day. Regular urination results in yellow urine. When your body doesn't have enough fluids and you don't urinate regularly, the urine in your bladder sits and becomes very concentrated; this results in abnormally dark urine. While orange-colored urine from eating carrots is harmless, there are ways to help your urine remain a normal color. Drink plenty of water to help keep your body hydrated and to dilute your urine. Keeping your urine diluted will help the color of it appear more natural when eating carrots. Limit the amount of carrots or carrot juice that you consume to help keep your urine within a regular shade of yellow. If you can't identify the exact reason as to why your urine is orange, talk to your health care provider. It may be a side effect of a medication that you're not aware of or it could be caused by a supplement that you take. Keep track of your diet, medication and when your urine begins to change colors. If it's caused by diet, your urine should resume it's natural color fairly quickly. If it's caused by a medication or dehydration, you will not be able to remedy the situation without the help of your physician. Can Vitamins Change the Color of Your Urine?